I’ve been using the G100s for the best part of the last week, even taking it to my day job and using it for a couple of days. The strongest impression it made on me is that, despite its relatively small size, it never felt uncomfortable to use. I had to adapt to it and use a fingertip-style hold on it, but doing so did not create any unpleasant fatigue. It tracks superbly and precisely. This is useful in both gaming and non-gaming scenarios. Whether you’re using it in Call of Duty: Modern Warfare, SimCity Deluxe, Excel, or in day-to-day Web browsing, accuracy and predictability are attributes you want in your mouse. Button feel is good, crisp. It’s neither too stiff nor too mushy. The scroll-wheel’s action also shares a similar impression of high quality. Whether you’re rolling it or clicking it, it never ever feels cheap and chintzy. The G100s glides on most surfaces. Whether it’s on a padded mousepad or the bare top of a wooden desk, you can move it effortlessly. The only surface where the friction level seemed higher was, oddly enough, plain Bristol board. Even then, the G100s just seems to glide as you move it along with your fingertips guiding it. It’s hard to say much about the LGS as it applies to this particular mouse. The G100s is as basic a mouse as I’ve ever encountered, so the extent to which you can play with the software is limited. Having said that, the GUI is superb. 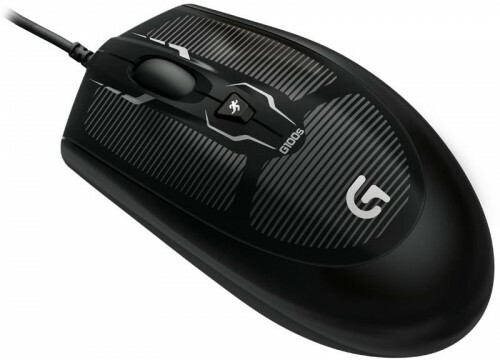 Its user-friendly and intuitive design and implementation are much more straightforward than the older SetPoint Logitech software (I’ve used the G9X and the classic MX518, which was the very first mouse I’d ever purchased back in 2006). As good and solid and unpretentious as the G100s is, it’s not absolutely perfect. I’ve got a few nits to pick. First, I wish the surface was grippier than it is. With your mouse hand’s contact patch reduced to just four points with a fingertip grip, I would want to feel a more secure and slightly stickier surface, especially on the mouse’s flanks. It’s a small complaint, but just the same I would still want it if Logitech ever asked me how to improve the G100s. My next small gripe is a bit more personal: I don’t particularly like the graphics on the mouse. I understand that you need to make your product stand out, but the graphics make the G100s look like some kind of gigantic bug on your desk. The graphics might have the opposite effect as intended: Customers who want their hardware to look good might get repelled as if they’d been sprayed with Raid or something. My final complaint has to do with the thin cable. As I touched on earlier in the review, it’s thin and bereft of a braided cover. It’s old school, sure, but I wish the cable was braided if only to allay my fears for its long-term reliability and resistance to damage. The G100s can be had for $39.99 USD or less. You might be tempted to think that it’s not much of a mouse at that price, but I’d suggest that a recalibration of expectations and perceptions might be wise. You see, the G100s might be the most affordable mouse in Logitech’s new G line of gaming peripherals, but it’s also like a stripped-down sports car in this specific way: You get everything you need, and nothing more. Like the classic Porsche 911 Carrera RS 2.7, the G100s is all about distilling an experience to its purest elements. Agility, lightness, delicacy all add up to a compelling product, all at an attractive and logical price point. It’s simple, straightforward, and honest, just like a three-chord blues song. Despite its “flaws” (which really are just this reviewer’s minor complaints which end-users may not necessarily have any issues with), the G100s earns a well-deserved Editor’s Choice award from Techgage. The G100s is available from Amazon and Newegg.